But what if I told you it wasn't beef? What if I told you the name of the game was moose?! Well, if you live where I do, you'd probably say, "So, what?" Or, if you are a hunter, living anywhere north of California, you probably wouldn't be too surprised! But, if you're an average Jill, average Jill's don't see a moose, let alone eat one, very often! Now, I've tasted moose before, but never cooked it for myself! So, having been given a couple of pounds of frozen moose meat, I figured I'd better give it a try. What do you do with moose? I decided the safest route for my first endeavor would be burgers. Like I mentioned before, we live in a rural area, so I try to do all my shopping once a month in one fell swoop at the Winco in Spokane, which is an hour away. Today being the last day of the month, supplies are a little low, and the cook (that would be me) is more than ready to go grocery shopping tomorrow! So, since I'm running out of almost everything, today was the perfect day to pull out the...(fanfare please)...moose! Really, there's not that much to tell that is entertaining. 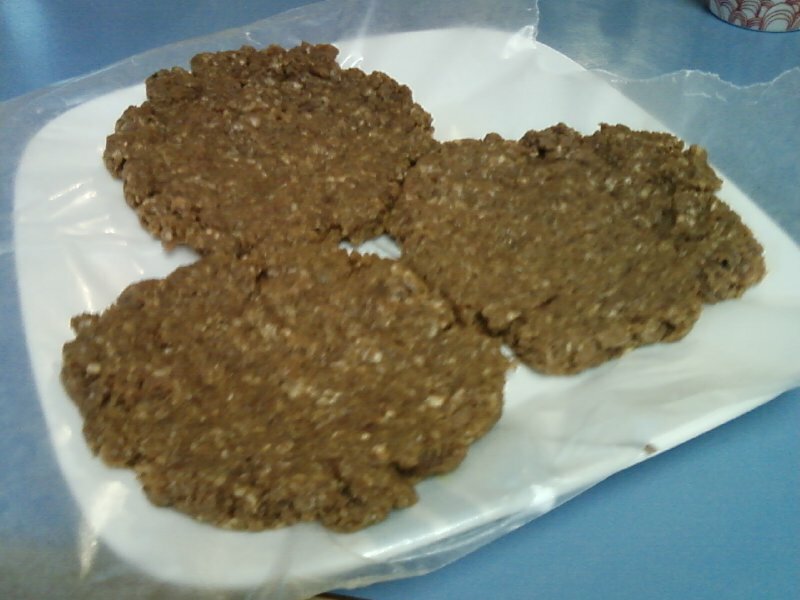 It looked much like raw ground beef, except that it was not red, but brown to begin with. The smell was different however, especially since I think the grinder probably threw in some additional spices. It was very strong and spicy, which I also attribute to the fact that it's wild game! The meat was very lean, and even with the addition of some ketchup, mustard and Worcestershire sauce, hardly held together enough to shape into patties. So, once I had them formed, I put them on wax paper and stuck them in the freezer for almost an hour so that they would be easier to handle. While the meat was in the freezer, I chopped up some potatoes to make French fries (inspired by my sister-in-law's cooking blog, http://catzinthekitchen.blogspot.com/!). Since we have no BBQ grill yet (Newlyweds! Still acquiring stuff! 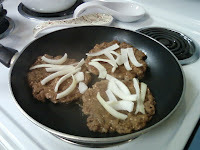 :) and the weather isn't quite nice enough for it anyway, I fried the burgers up on the stove top. I heard that onion draws out the wild, gamy taste, so I sliced up a bit to put on top while they cooked. 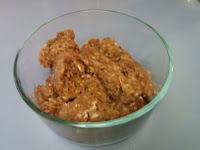 I also tried to keep the fat drained out of the pan (although there wasn't much at all!) since one hunting website warned that most of the wild taste comes from the fat. 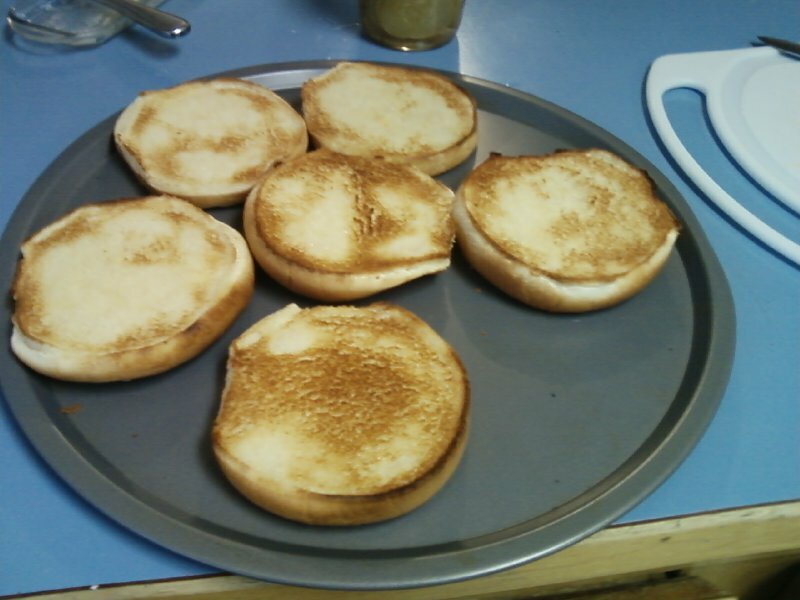 While they were sizzling away, I toasted some buns under the broiler. 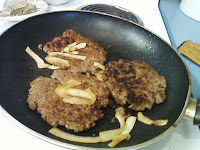 It smelled wonderful, and with cheese, lettuce, and a neighbor's homemade pickles piled on top, it tasted wonderful too! It wasn't too gamy- just enough to remind me it was moose I was eating! That looks fantastic! I hope the fries turned out good. I've heard that Buffalo and Moose is one of the more Lean of the meats. Very cool. On a side note...we need to go grocery shopping too, my fridge is bare. Hahaha!